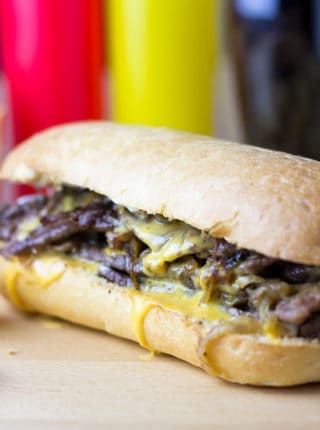 Slow Cooker Philly Cheese Steak Sandwiches that are so tender and flavorful you’ll feel like you’re in Philly. Perfect for a crowd! 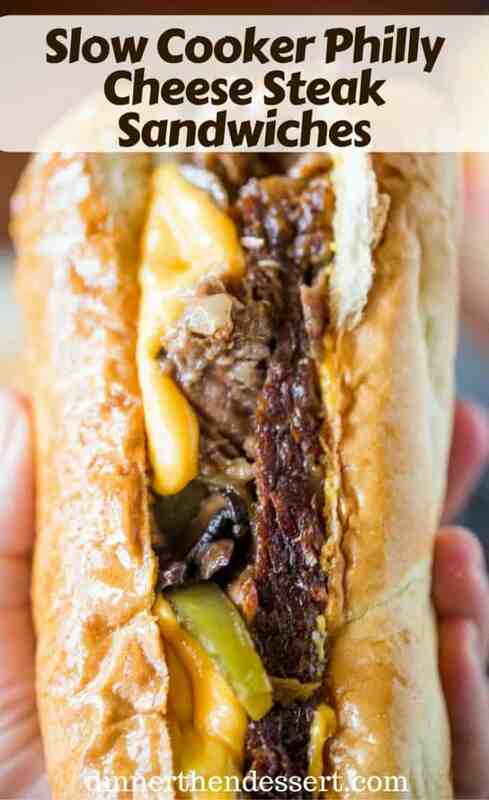 Slow Cooker Philly Cheese Steak Sandwiches are the answer to all your Philly Cheese Steak dreams. We’ve made this recipe three times in the last two weeks and I think I’ve enjoyed so many I’ve already matched my 2016 beef consumption in just that time. 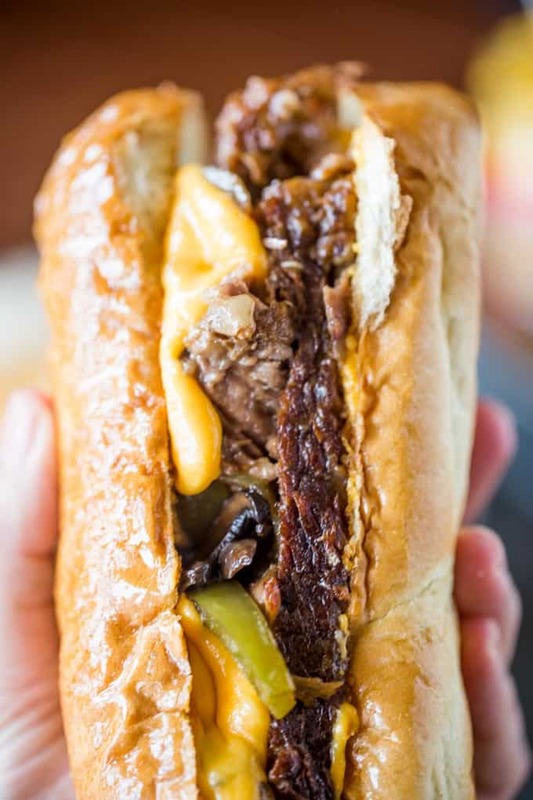 The beef is super tender, the liquid left behind is magic (I actually froze what liquid I didn’t add to a little bowl for dunking – I know like a cross between a french dip and a Philly cheesesteak but the liquid was SO good). 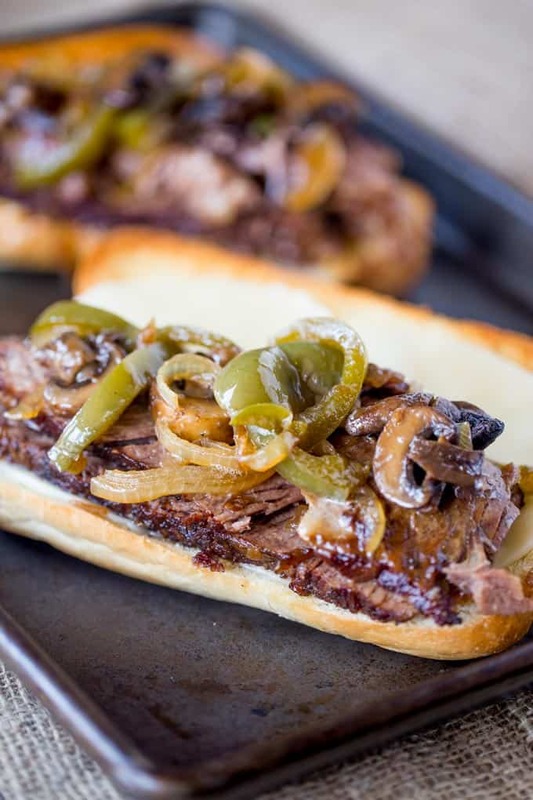 The bell peppers, onions and mushrooms add a delicious flavor to the beef, the liquid and the sandwich. 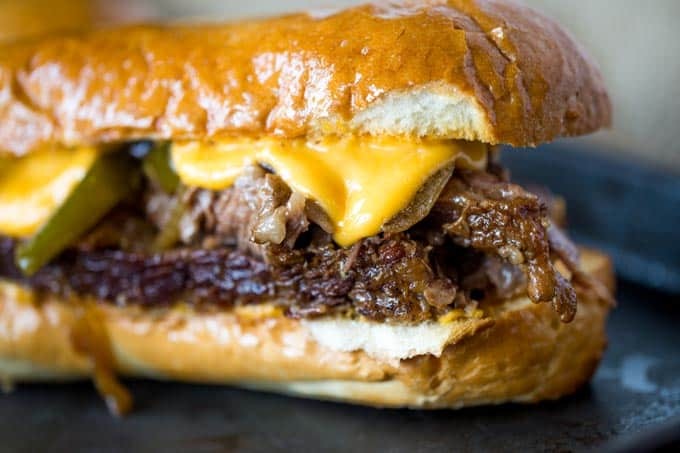 I’m by no means a purist when it comes to cheese steaks, I will take them any way I can get them I love them so much, so these Slow Cooker Philly Cheese Steak Sandwiches were right up my ally. We made them for the superbowl party we had and they were such a hit we just haven’t stopped. 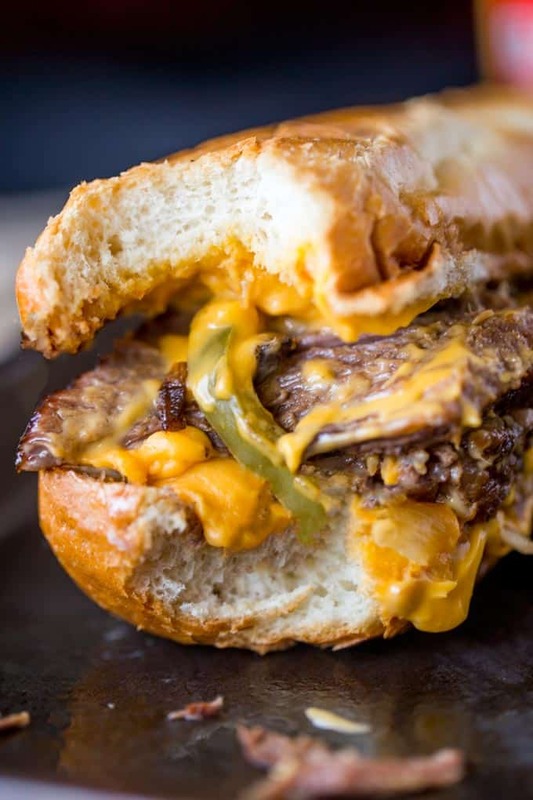 I will say the most authentic thing about these Slow Cooker Philly Cheese Steak Sandwiches that people from Philadelphia won’t be upset with me for is the Cheez Whiz that I add to them. 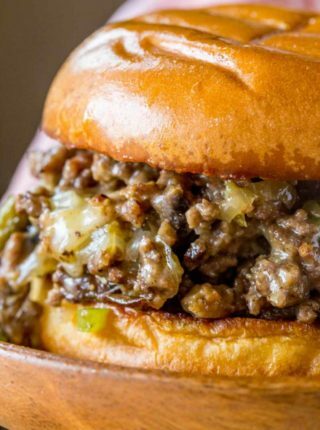 It melts and acts like a delicious sandwich glue that you’re going to love. The blog has been slow cooker obsessed these last few weeks. I think it has to do with the terrible weather we’ve been having, but seeing a slow cooker slowly bubbling away on the counter just makes me so happy these days. 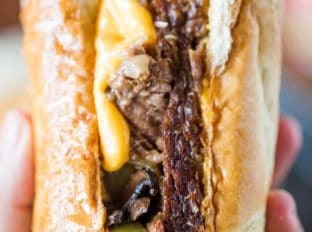 Looking for more Cheese Steak recipes? Look no further! I brown the beef for a good five minutes on each side before putting it in the slow cooker. 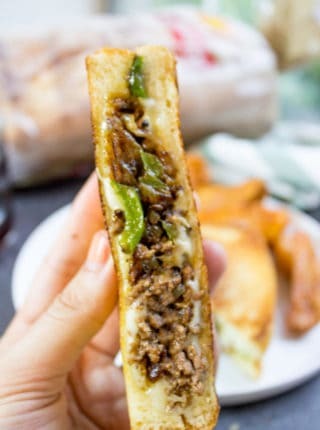 I mean look at that crust in the sandwich photos! I add the veggies in the last hour, if you add them into the pot in the beginning they’ll melt into nothing. If you forget/arent home in time you can also sauté them quickly with canola oil, kosher salt and pepper on medium high heat, then just add them on top or even stir them into the slow cooker just before serving to get some of the cooking liquid on them. This isn’t a sandwich you have to dip to enjoy, and I would say about 50/50 were pro-dip vs no-dip, but the liquid left behind is amazing, don’t toss it. Consider Cheez Whiz, but if you’re anti-processed cheese I highly suggest Provolone, thats what my husband puts on his and it is also awesome. To give his cheese a better melt I dunk the provolone slices in the liquid with some tongs for a few seconds before putting them onto his sandwich. Consider buttering very lightly and then toasting your hoagie rolls. It takes the bread to another dimension. Enjoy and please come back and tell me your thoughts! Worcestershire Sauce: I have been using this brand most of my life and when my husband came home with the store brand one day and I figured “eh no biggie” I could immediately taste the difference. Stick with the original. Cheez Whiz: I know what you are thinking, Cheez Whiz? YES, but I really only use Cheez Whiz when it comes to cheese steaks. Sometimes you have to go with the authentic ingredient and push the thought of “processed cheese product” out of your mind. Alternately feel free to use provolone which is also delicious. Strand Brewing Company Beer: Love their beer, if you are in California you can even buy it at Costco. No sponsorship here but just lots of delicious beer. Season the chuck roast with the Kosher salt and pepper (if you are sensitive to sodium, adjust to your taste or you can even leave the salt out altogether since you’re adding broth and soup). Heat your pan (or if you can brown in your slow cooker, do it in that insert) to medium high. 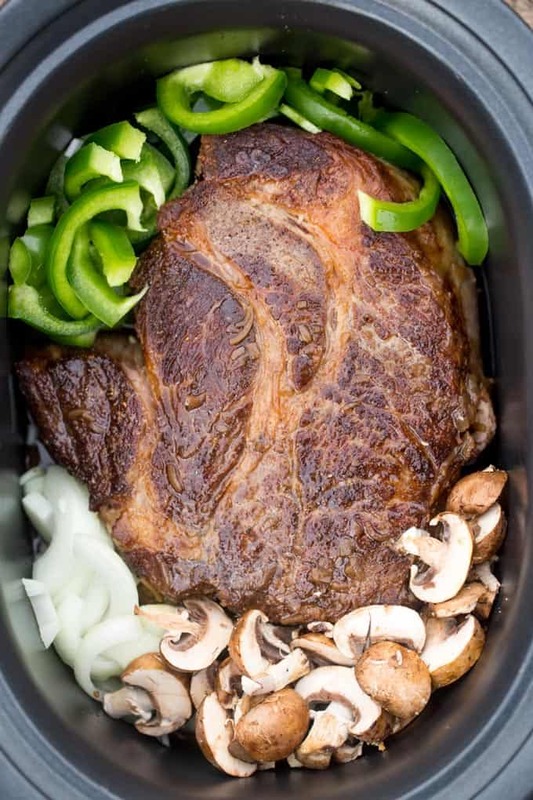 In your slow cooker add the beef, the beef broth, the french onion soup, Worcestershire sauce, and the beer. Enjoy drinking the second half of that beer! Add in the onion, mushrooms, and bell pepper in the last hour of cooking. To serve, toast your hoagie rolls with a bit of butter spread onto the cut sides. With a very sharp knife cut your beef against the grain. Add you cheese of choice, some of the meat and top with the cooked veggies. I like to have a bit of the liquid (with the fat skimmed off on the side,) but it is totally optional. 5 stars for sure! The only thing I’d change is to increase the bell pepper from one to two. My husband is going to love, love, love this recipe! I totally agree with you regarding the “Cheez Whiz”…need to keep this authentic. Thank you, l can feel the love in your recipes and cooking style. Hi! 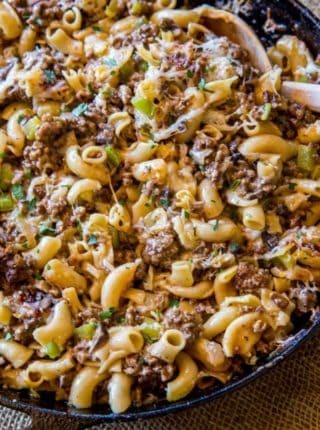 I used to be a vegetarian for years, so meat is still kind of fun for me to try in different recipes. So as not to sound to dumb, but needing to know- does it say Chuck roast right o the package? I’ve never cooked one! And is that the only type of meat that should be used? Thanks bunches! It should but you can always ask your butcher too. They’re always there to help! Hi Sabrina, is it ok to brown the meat the night before and then place it in the fridge? Mornings are a challenge, would love to simply turn my crockpot on in the morning. Thanks! Unfortunately you can’t. You never want to brown or partially cook beef to refrigerate and finish cooking later because any bacteria present wouldn’t have been destroyed. Sorry. I was wondering what would need to be changed if anything, when the roast is frozen. You’ll want to have it completely thawed before placing it in the slow cooker.